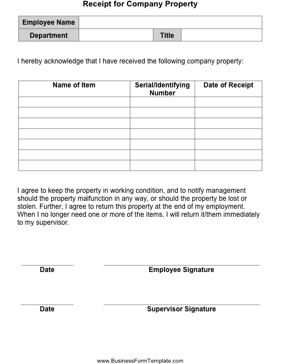 Have an employee fill out and sign this form to indicate what company property he/she has in his/her possession. I agree to keep the property in working condition, and to notify management should the property malfunction in any way, or should the property be lost or stolen. Further, I agree to return this property at the end of my employment. When I no longer need one or more of the items, I will return it/them immediately to my supervisor.